I absolutely love this. 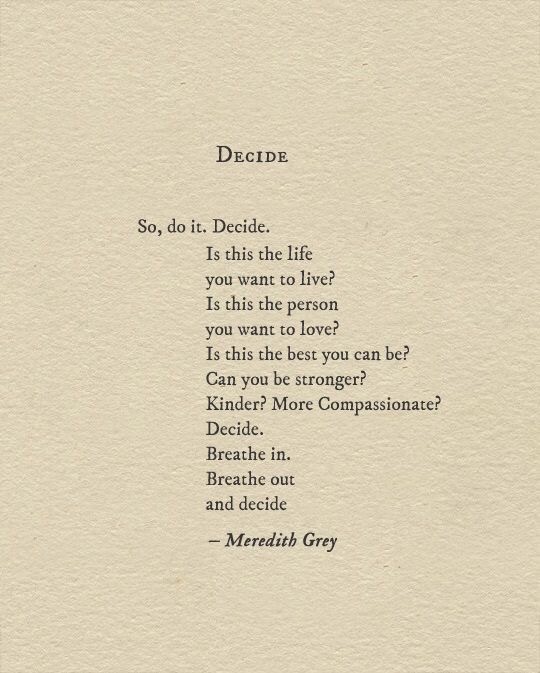 Not only because it’s a Grey’s Anatomy quote, but because it’s so bold and to the point. Is there something you want to change about yourself? Something you’re not happy with or want to change to feel better about yourself, your life, your current situation? DECIDE you want to change it, and push down on the gas- never lifting your foot until you’ve reached the destination you want to reach. Personally, the last few months of my life have been so hectic and scattered. If you’ve read my previous blog, you’ve seen I recently got married- and in the time where everything is focused around YOU and YOU are supposed to be first- I lost myself at times. I decided that I was full steam ahead in wedding mode, and put some other things on the back burner that I want to pick back up now. I always want to share the things I’m personally feeling to not only be transparent, but to give an example of what I talk about in each post, with hopes it will help you reflect too. I’ve decided, I want to feel healthy again. The wedding and honeymoon were absolutely fantastic!.. but I’ve deciding to get to the point where I LOVE how I feel about MYSELF and that I can feel stronger. What is the thing you need to decide to do, and what is the propelling motion you need to make that happen?